CAREER: Francis learned to read music at a very young age while growing up at the Belmont Orphanage. He went on to form his own band which was very popular in the 1950s and 1960s. 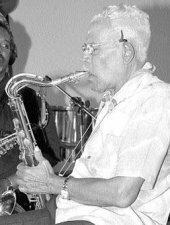 He was the musical director for the Tempo Recording Company where he arranged music for many calypsonians, and accompanied several of them in their recordings. He gave up his band to further his studies at Berklee College of Music, and worked with the famous recording artist Harry Belafonte while in the USA.